It`s been over 10 years in Japan for me and you see a lot of things that can amaze you and I post them as things only in japan. They can be shocking or funny or inspirational. This video was recorded by a good friend of mine, Pastor Rie. She has a great blog in Japanese here for anyone interested. 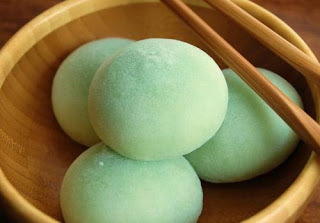 The video below is of mochi being made by one of the best in the world. The speed and performance recording by Pastor Rie`s video is amazing. This is her favorite place to buy Mochi which is a Japanese sweet rice treat. This is green because the flavor of the Mochi is Matcha a powered refined green tea in Japan. The shouts of the mochi master gives the rhythm to the man with the hammer so that they can coordinate to make the mochi fast. The rice starts out as regular rice and as it is pounded it becomes like dough and is usually served with sweet beans. This was taken in Kyoto, Japan. Something like this you can only see in JAPAN. Everyday this man makes mochi and is a master of it. Below is another video with subtitles that has interview with the same man.